Looks like I’m slightly back on track for this week! I’ve been somewhat ultra-organized (yet at the same time, not) for the past week. I managed to get a podcast up, only to be thwarted by technology (drat you, technology! ), and then decided it was time to do a facelift on the site theme. Still working the kinks out on that one. Part of the reason for being a little more on-the-ball has to do with a couple of things. First, I’m trying to get the house in order, so I’m in real-life-Sims mode. Second, I mentioned on Monday that I’ve gone back to eating healthy. When this happens, the water weight sheds quickly and I feel a cross between euphoria and dizziness. I also wind up with pockets of huge bursts of energy. Pow! I also figured it was time to show off the knitting! First up, the plain & simple ONline socks. Being watched over by a kitty, because you can’t open the blinds and curtains without attracting (not so) small, furry critters that like to stare outside at birdies. I’m motoring right along on these, to the point where I decided to give it a little bit of a rest. I’m not liking the way I finished sock #1, and am thinking of ripping it back & finishing with a cuff. This means that I will likely do the same thing with sock #2, and while I’d dearly love to have them done and wearable tomorrow, I think I’ll give it the time it needs. Here we have the Noro Two-Row Shawl(ette?). It seems to be coming along right nicely. It’s taking almost a full ten minutes or so to do a row, which irks me slightly. I am determined, however, to push through. There is a part of me that has been thinking that I probably should have used larger needles, but I’m not sure if that’s my eye for gauge talking, or whether it’s because I’ve had the urge to cast on yet another plain sock out of striped Kroy that would use those needles quite well, thankyouverymuch. The other work in progress, that I haven’t taken a picture of, is The Diet. It’s been two days (well, three, technically, but the night is still young), and I’ve been doing well. The trick is going to be taking it through the week. As I mentioned, there’s some water weight lost – about 8 pounds so far. We’ll see how much more I drop, if any, by the rest of the week, and how much stays off. I really want to make this the year that we get into shape, so I’m doing what I can to keep the motivation high. Hopefully I’ll have some progress to show soonish! Time for another hard-hitting Daily Post question! What’s the single most important thing you accomplished in 2010? Well, I didn’t accomplish much that was too difficult. Really. I didn’t solve world peace, or end starvation. I didn’t write a best-selling novel, and I didn’t enlarge the family or find the cure for cancer. I knit a bunch of really nice stuff, tried not to have too many sick days at work, and generally just kinda got along with the universe at large. Nothing too extravagant. The knitting world, however…wow. I will admit, I snuck a peek at the knittyblog for some of this stuff, but I will say that I contributed to the growth industry: 2010 was the year of the independent designer. The most obvious example is Ysolda Teague. She had an idea, put a few .pdf files out there, charged a decent price for ’em…and people bought them. I’m one of those people. Add to that the extra customer service of a designer who reads her email & twitter and responds happily to feedback. Wowzers…if I wasn’t impressed before, I would be now. Stephanie Pearl-McPhee may only develop one or two designs a year, but her influence is very well known and respected amongst knitters. I was reading a blog the other day and it mentioned that one of their designs had been “harlotted”. What does this mean? 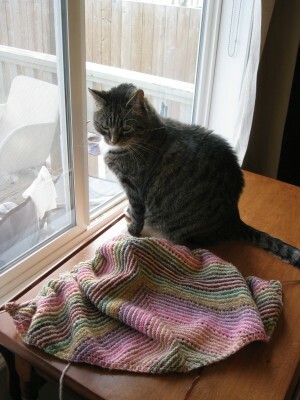 It was intriguing enough that it was knit up by Pearl-McPhee, and thus featured on her website, yarnharlot.ca. The designer witnessed a demand for her pattern, and thus was entirely boggled by the whole thing. I find this amazing. The aforementioned Ysolda? Got her start on Knitty. Sure, she was designing for herself back then, but from the accounts I’ve read, she put in a submission and it just happened to hit at a good time. With the amount of “Hit” patterns on Knitty (Clapotis, Fetching, Monkey to name a few), it’s no wonder that it’s influential. Add onto that the opening of Ravelry, and the relative ease with which a knitter/designer can add their .pdf file into the store. It’s not small change that we’re talking here. Whether or not the owners/creators earn anything above and beyond their operating costs is a question for someone more financially astute than I, but I wouldn’t be surprised if there was a tidy business being done by some of the more intrepid designers out there. It’s a different model of doing business, and certainly one that will likely be more closely looked into as more avenues open up. Lastly, because of the influences of “Rock Star” knitters, and popular designers due to the new model of business, the “old school”, traditional media are also taking notice. I have seen more knitting publications in the past year or two than I have seen in the past five, and it’s mainly due to the internet media’s popularity push. When I first started knitting socks, I had a pamphlet from the 1960’s that I’d snagged from my Mother’s small pattern repository. I managed to get my hands on Knitting Vintage Socks, and Favorite Socks from Interweave, and those were my main resources other than Knitty. Now? You can’t walk into Chapters/Indigo without tripping over sock-knitting resources. The market is absolutely flooded. Wendy Johnson and Cookie A, two of the best know sock-mavens, got their starts on the internet, developing brand new business strategies through downloadable media. I saw this particular little weekly feature on Turtlegirl’s blog and thought I might follow suit. Of course, afterwards I googled WIP Wednesday, and apparently it’s not a new idea…so now I don’t feel quite so cheesy! 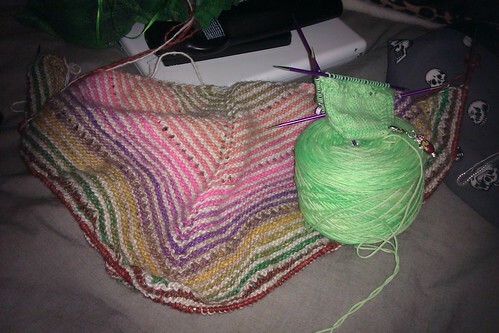 My Noro striped shawl is shaping up quite nicely. It’s getting large enough to take more time to get through a full row and back. Of course, this means that it’s harder to put down when the phone rings or the door needs answering, or (more likely around here) someone needs to get the kettle or take dinner out of the oven. I’m enjoying it, though, and I can’t wait to be able to wrap myself in it. It looks like it’s going to be wonderfully snuggly! Sometimes I think that it takes forever for me to finish a project. Sometimes, I forget that some of my projects are wee, but with tons of tiny stitches (ref: Socks). Sometimes things don’t take as long as you think they will. Or be as difficult as they could be. Sometimes, just sometimes, you realize that the perfect project is portable, colourful, light, and full of holes. That, my friends, is a finished (small) Ishbel, designed by one Ms Ysolda Teague. The yarn is Sweet Georgia Tough Love Sock in “Botanical”. It didn’t want to be socks. It really didn’t want to be socks. The first time, the gauge was off. The second time, the heel turn was sloppy (it was a pair of Sleepy Hollows, and far be it for me to diss a pattern the Yarn Harlot loves, but something just wasn’t working out for me. Maybe later). 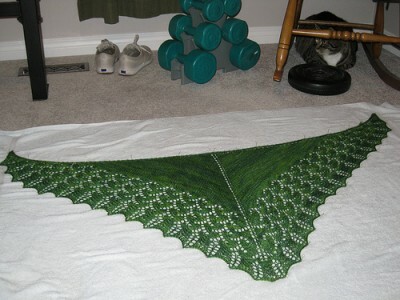 The variegation in the monochromatic green was gorgeous, so I decided to try it as a shawlette. And I love it.